Piston drill pumps of the following dimension-types NB32, NB50, NB-125, NB-125A, NB-125KZ are designed for injection of liquid mud into the well in geological prospecting, structural and exploratory drilling for oil and gas, as well as for other flushing and squeezing works during well repairs, water injection at stimulation of oil production and for pumping various non-aggressive liquids. Purpose: Drives of sucker-rod pumps of the following dimension-types SRPD 6-2,5-2800, SRPD 6-3-2800, SRPD 6-3-3500, SRPD 6-3-4000, SRPD 8-3-4000, SRPD 8-3-5500 are designed for individual mechanical drive of sucker-rod drilling pumps at extraction of oil from deep wells operated in a macro-climate regions with temperate and cold climates. The walking beam cap rotation system has a unique design concept. Specifically, instead of connecting the cap with the walking beam by one central axis, the cap is fastened to the walking beam by four pins, located on the top and bottom surfaces of the walking beam on both sides. Rotation of the cap upon the longitudinal axis of the walking beam and its fixing in any position is then carried out by means of a screw coupling. This solution was created at the request of customers as being more simple and reliable. It also negates the need for periodic replenishment of lubricant in the node. The metal construction of the walking beam is from one column double-T-iron, thereby reducing the amount of welding needed and consequently, the volume of internal stresses in the assembly. According to estimates, there is no reduction in its design strength. As an extra safety measure when performing maintenance and repair works, there is, in addition to the braking system, a further failsafe that fixes the walking beam in place using a screw coupling that stops the walking beam actuator and the post. At the request of customers, the GOST 8752-compliant rubber armoured collars used in the construction of walking beam supports, cross-bean bearings and bottom connecting rod ends were replaced by a felt seal. This was considered cheaper and easier to use and in addition, is simpler to purchase or fabricate. The control unit circuit includes limit switches. These give an emergency stop signal for the rocker machine actuator in the event that connecting rods break. Filling with oil, inspecting the condition of the toothed gearings, cleaning the magnetic chip catcher of any broken teeth or gear wheels and lubricating the transverse support bearings. It also gives access to the ladder leading to the upper platforms. The second platform is designed to service the walking beam support and for maintenance of the screw couplings at the cap rotation, its fixing and the walking beam fixing. - A plug which can be removed only with a special key prevents unauthorized discharge of oil. Purpose: Reducers of the following dimension-types Ts2NSh-315, Ts2NSh-315U, Ts2NSh-315US, Ts2NSh-450, Ts2NSh-450U, Ts2NSh-450US, Ts2NSh-450M, Ts2NSh-560, Ts2NSh-630, Ts2NSh-750, Ts2NSh-750U, Ts2NSh-750US, Ts2NSh-750B are double-reduction type with cylindrical double helical gear of Novikov gearing are designed to reduce frequency of rotation transmitted from the electric motor to cranks of the sucker-rod pumping unit. 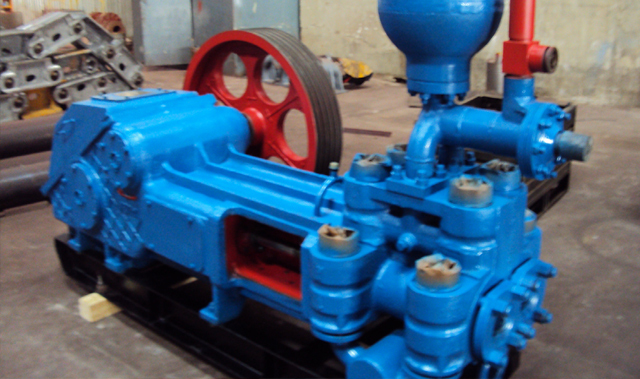 It is used in sucker-rod pumping units and other mechanical drives of sucker-rod drilling pumps. Spare parts to pumps: impellers, guide vanes, shafts, pinion shafts, jackets, sleeves, crosshead housing, gear clutch, etc.